My problem: ugly sheer curtains, made even uglier by our cat Kitten, who likes eating them. (Seriously, you can see the hole to the far left about halfway up, where he’d sit on the arm of the chair and chew the curtains.) 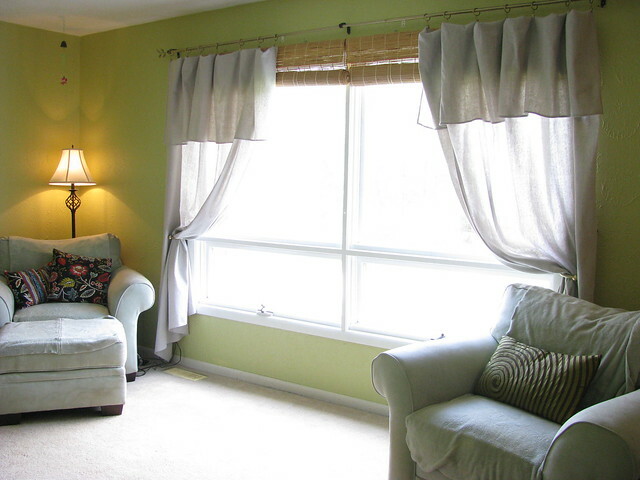 I didn’t care for the look of the sheers, but they were left by the previous owners of our house and keeping them up was just the easiest thing. Shame on me. But then, you know — Pinterest: eye candy everywhere, and solutions to all household problems! I saw so many different posts about drop cloths used as curtains, I just had to try it. 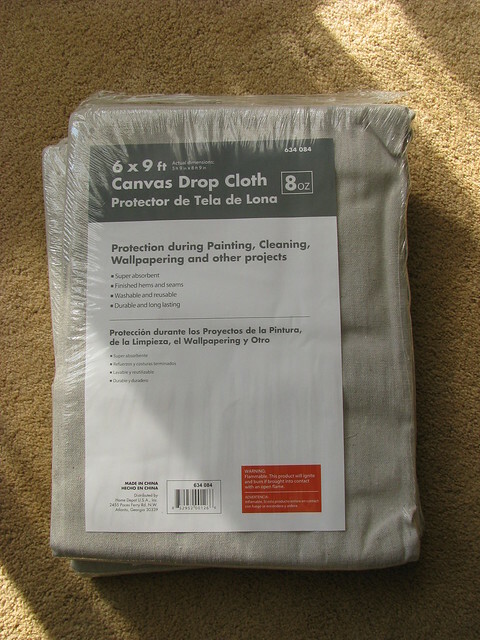 I went to Home Depot and bought two 6′ x 9′ drop cloths for less than $11 each. Colors vary slightly, so if you try this yourself, flip the packs over in the store so that you can see more of the fabric and find two that closely match. They come already hemmed along all edges and are one big seamless piece of fabric. Since I haven’t yet decided whether I’d like to paint them, add ribbon trim, dye them or what — so many ideas on Pinterest — I decided to just wash them, run them through the dryer, iron them and then hang them up. I didn’t even want to hem then yet, so I just folded them over at the top and used curtain clips to hold them to the curtain rod. So easy. They iron beautifully and in person they almost look like linen. I certainly prefer them over the awful sheers, and I’ll have fun trying to decide how I might want to personalize them. For now though, I’m enjoying them as they are! Thank you, Cat! It was so easy and they look great in person! It’s flippin’ brilliant! I’m definitely copying you for my guest room and thinking about citra solving those bad boys. So smart….and I promise to link this like crazy cray! So glad you like them, Meghan! :) I like them so much I think I’ll buy some more for use in another room. Can’t wait to see yours!